Pulpa Dip tamarind dipping sauce. Great to add on chips and snacks, as well as fruit like jicama, cucumber and carrots. Pulpadip is a savory and tangy tamarind flavor sauce and candy that is used to give flavor to different snacks such as fruits (mangoes, apples, peaches, apricots, etc), vegetables and can even be used as a marinade. Its unique presentation makes for a useful squeeze bottle that is very convenient for pouring any snack you desire. Its sweet and tangy flavor is irresistible, so much that once you try it you won't stop using it on your snacks. It really does enhance any food fruit or vegetable you pour it on, from a plain snack to a scrumptious mouthwatering treat. 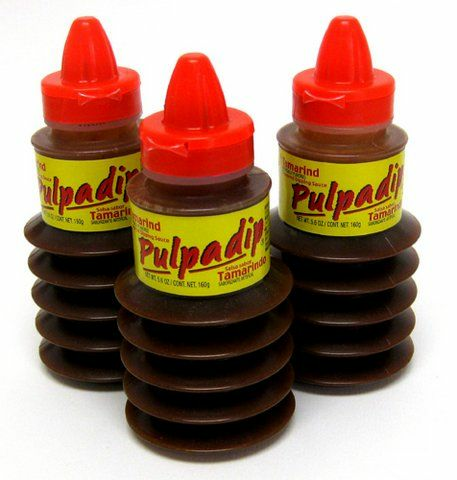 Pulpadip es deliciosa, enchilosa y agridulce salsa con sabor a tamarindo que se utiliza para darle sabor a diferentes botanas como frutas (mangos, manzanas, duraznos, chabacanos, etc), verduras y que tambien puede usar como marinado. Su presentacion original la convierte es una botella utile y muy conveniente para usar en cualquier botana que desees. Su agridulce y enchiloso sabor es irresistible, tanto que una vez que la pruebas no podras dejarlo de usar en tus botanas favoritas. Realmente mejora cualquier comida o botana (frutas, verduras, dulces, etc) donde uses este deliciosa salsa de tamarindo, y convierte una botana simple en un aperitivo que te hara agua la boca. They should it sell it broadly in the US! very good spicy and sweet.